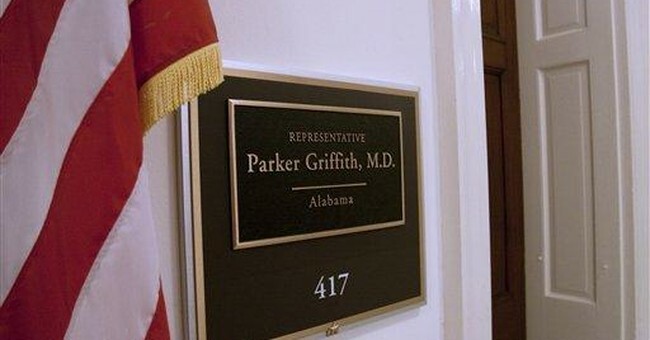 Given Griffith's unique perspective -- he is also a doctor, with 30 years' experience as an oncologist -- perhaps he has some insight into why the White House and his former Democratic allies in Congress continue to press forward on a national health care bill despite widespread public opposition. It's gotten personal, Griffith says. "You have personalities who have bet the farm, bet their reputations, on shoving a health care bill through the Congress. It's no longer about health care reform. It's all about ego now. The president's ego. Nancy Pelosi's ego. This is about personalities, saving face, and it has very little to do with what's good for the American people." Conflicts driven by personal feelings can lead to self-destructive outcomes. Ask Griffith whether Speaker Pelosi, his old leader, would accept losing Democratic control of the House as the price for passing the health care bill, and he answers quickly. "Oh yeah. This is a trophy for the speaker, it's a trophy for several committee chairs, and it's a trophy for the president." It does not seem to matter that if Democrats lose the House, the speaker will no longer be speaker, the chairmen will no longer be chairmen, and the president will be significantly weakened. The polls are wrong, they say. Or the polls are contradictory. Or the polls actually show that people love the health care plan. And even if the polls are right, and people hate the plan, real leaders don't govern by following the polls. So just pass the bill. That's easy for Democrats like Pelosi, who occupy safe seats. Not so for dozens of moderate House Democrats whose votes are required for passage, but who face likely defeat for it. "I don't think there are that many moderate or conservative Democrats who want to be sacrificial representatives," says Griffith. Just for the record, the RealClearPolitics average of polls on the Democratic health care plan shows 51 percent opposed and 40 percent in favor. A similar compilation of surveys by Pollster.com shows the gap at 51 percent to 43 percent. There have been more opponents than supporters of the plan since last July, when Democrats first began to unveil concrete health care proposals. Can Democrats really ignore the polls all the way to the end? Yes, but it gets a little harder with each passing day. George W. Bush couldn't ignore public opinion when he wanted to remake Social Security and pass comprehensive immigration reform. Faced with broad opposition, Bush ultimately gave up. And now Democratic leaders are showing signs of weakness. Why would they suddenly express interest, even feigned interest, in Republican ideas they derided for months? Why would they invite GOP lawmakers to a high-profile discussion of health care? Because they don't have the votes to pass the bill. "If they had the votes, we wouldn't have had the summit," said Tennessee Republican Rep. Marsha Blackburn recently, referring to the day-long White House health care confab on Feb. 25. That's a change from the heady days of last year, when Democrats, as Griffith says, "never really wanted anyone else's input" on health care. When a Republican offered a suggestion, "There was a polite smile and a comment like, 'That's very interesting, and we'll take a look,'" Griffith recalls. Of course, they never did. Now, they make a big show of listening. But it's too late to make the fundamental changes that would be required to improve the bill. It's too late to change public opinion. It's too late to reassure nervous lawmakers. The Democratic leadership has made the decision to push the bill to the very end, and so they will.